So, the Imagine Cup is finally over. For those of you who are just joining us, the Imagine Cup is a brilliant competition organized by Microsoft that pushes students to develop technologies that help save the world. For the past ten or so months Wajih and I have been hard at work developing our entry called: Tale of a Tree Wisp. We got to present our project to a vast variety of people and we got a lot of positive feedback. We didn’t manage to win anything, mostly due to the fact that we were in Software Design rather than Game Design, but we walked away with something that might be a little more valuable. The best bit about making games is seeing how people react to them, I said this when we won the local competition and I’ll say it again now. We got even more exposure in the world finals and it was really a treat. Heads at Microsoft, including Mr. Somasegar, passed by our booth yesterday in the World Festival that took place in the Lincoln Center and they had nothing but positive feedback to give. myself, standing next to the booth. Walid Abu-Hadba – Corporate Vice President, Developer & Platform Evangelism Group – urged us to get out and start our own game company, and last but not least we got to show the game to Mr. Julian Gerighty – IP Developer at Ubisoft, who took the time to play our game and ask us a lot of questions about it. So, now that the Imagine Cup is over, what is my next step? Well, I am hopping on a plane to Chicago in a couple of hours where I intend to spend a good 4-6 weeks on a sort of development sojourn. I have a few game ideas I would like to work on using UDK/UDK Mobile and hopefully by that time I should have something to show. I would also like to give my website a massive face-lift that I’ve been scheming for the past few months, and finally I would really like to continue my UnrealScript Tutorials. I had a lot of comments and messages about them, particularly the game save system and unfortunately I could not address any of them. 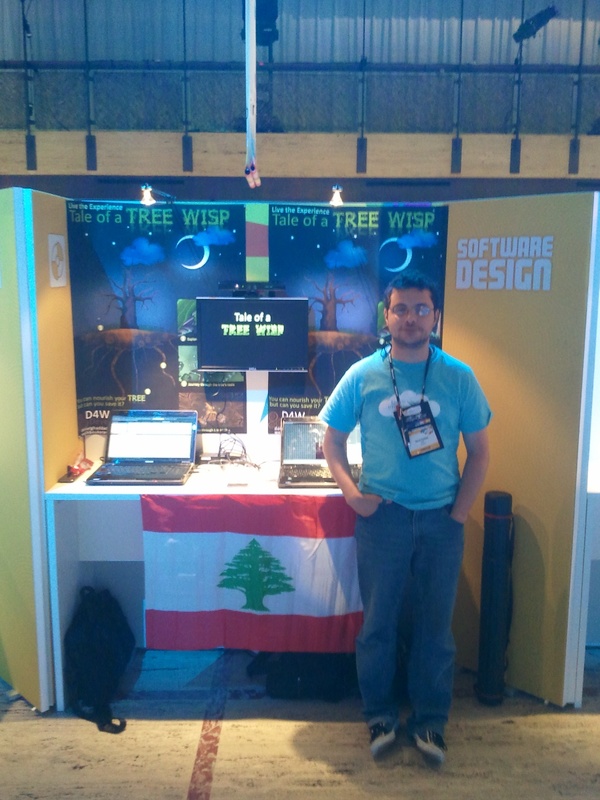 Wajih and I will also finish Tale of a Tree Wisp (he is heading back home and soon moving to KAUST to do his PHD) soon enough as I intend to not only release it, but include it in some game design competitions I have my eye (the other eye is preoccupied somewhere else) on. I think it is also time to join the ranks of the industry. I’ve spent nearly three years now experimenting with games and working on several projects (and I will continue to do so) but I feel like the next step for me is to join the ranks of the industry and expose myself to new challenges and experiences. So time will tell where I end up. In a few days I’ll immerse myself again in UnrealScript, writing all the tools I would need. I’ll also work on that site face-lift and (what I’m maybe most excited about) finally find the spare time to read, write, and play some games again. If I were to take something away from all this it would have to be all the positive feedback. This was by far the most stressful game I ever worked on (I have the ulcers to prove it) and over the course of 10 months I saw the game differently than other people might have. When you spend a long time working on anything you don’t see it like other people might. You see what is underneath, the pistons pumping, the gears crackling and churning, the blood, sweat and tears that went into it… and you lose the ability to see “the magic”. It was very rewarding watching people get all excited and wide eyed about Tale of a Tree Wisp and the most rewarding one of them all comes from back home. Shortly after presenting the prototype for Tale of a Tree Wisp to the finalist panel of judges in Lebanon we left the room as they deliberated. Soon after they came out with the unanimous decision. A friend of mine who was among the press overheard one of the judges saying that our demonstration was “like meditation” and that was very surprising to me. I never would have imagined that someone would feel something like that about anything I developed, and that stuck with me ever since. Now, enough babble about the past. There is still a long way to go and it is time to take the next step. Thanks for all the support, and for everyone who voted. If I’m honest, I’m not used to having a blog that gets visited by someone other than myself and my mum (hi mum!). I recently mentioned that I’ll be releasing a tutorial on every weekend that should help beginners get by (mostly related to UDK). I haven’t forgotten about that and I still intend to do so. The problem is both my projects need some extra attention with deadlines looming so I’m spending most of my time focused on that, day and night, weekdays and weekends. The upside is there will be some interesting announcements soon so keep checking in or follow me on twitter (DanielLoony) for all the latest. As for the tutorials, they will resume just as soon as I have some free time on my hands. Sorry for the silence but it can’t be helped. As my head was pondering things related to games I realized that I haven’t touched my blog in a while (blame twitter) and even worse so my website hasn’t seen any updates in ages! Returning visitors interested in seeing my progress might just think I’m procrastinating! Since I consider myself a Faustian chap I had to quickly clarify the situation. After a few months of experimenting Wajih and I finally buckled down one evening in our little apartment and began to brainstorm a series of small games we intend to make. A few months before that we got together and formed a small dev team (with a few of my colleagues internationally) that we dubbed D for W or simply D4W (think about it). The brainstorming lasted well into the night and before we knew it we had a whopping 6 game ideas that we really wanted to implement. We decided to start with one and we’ve been on it since. It was one of those projects that grew over time. We had a very simple idea and Wajih (the W of D4W) quickly set-out building the tools we were going to need and I set-out to coin the gameplay elements, assets, and pretty much everything else. There were a few problems and I sought to address them – conveniently at around the same time an opportunity presented itself to join the Imagine Cup. We were hesitant to join (and still are iffy about it) but while reading the topics of the competition it all fell into place perfectly and I unleashed a whirlwind of enthusiasm and changes. The story I had already thought of worked perfectly with the theme and so our game took form – a really good form. But it wasn’t all pleasant. Without giving too much away – we initially decided to do things in a certain way that would make our game a simple casual endeavor but remember that whirlwind of change and enthusiasm? Well that changed a lot and W went back and reworked the tools and a lot of problems surfaced. I had my work cutout for me while W was fighting off index dragons! Things got horrendously stressful but we pulled through. A few weeks ago our tools were ready for development and I took flight developing a prototype level. The level is complete and an early prototype of our avatar was ready at the mere cost of a week of constant work and little sleep. We took our prototypes and showcased our technology to trusted eyes behind closed doors and the reception was great. We had our work cutout for us – the art needs a lot of polish, we need to start worrying about our presentation and things need to be really efficient. We have another meeting at the end of this month that might change a few things. Once again our time is short and we are hacking away at it. Some sacrifices had to be made to gather a few more hours to work on the project but I think we will hit that deadline and hit well. It also happens that March 31 is the deadline for the Games4Change competition award things (I’m not all too certain what they are exactly)… Since our game fits the category we might just join that. What is the game exactly? Well, I don’t usually talk about things till we have something to show (usually a small teaser or trailer) but I can say this, it aims to do things a little differently. Our goal is to make a really fun game that we enjoy playing but at the same time make it globally available for people around the world and try, as best we can, to impact them and ultimately impact change. Now, I need to get back to it so that’s all for now. You can follow me on twitter (@DanielLoony) if you would like to hear a few slips or find out how things are progressing. Until then, things may seem a bit stagnant on my site and blog.